The English Renaissance has long been considered a period with a particular focus on imitation; however, much related scholarship has misunderstood or simply marginalized the significance of emulative practices and theories in the period. 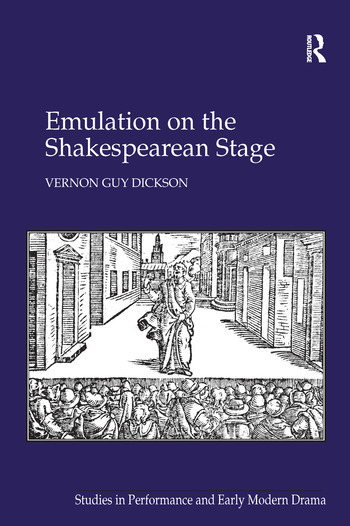 This work uses the interactions of a range of English Renaissance plays with ancient and Renaissance rhetorics to analyze the conflicted uses of emulation in the period (including the theory and praxis of rhetorical imitatio, humanist notions of exemplarity, and the stage’s purported ability to move spectators to emulate depicted characters). This book emphasizes the need to see emulation not as a solely (or even primarily) literary practice, but rather as a significant aspect of Renaissance culture, giving insight into notions of self, society, and the epistemologies of the period and informed by the period’s own sense of theory and history. Among the individual texts examined here are Shakespeare’s Titus Andronicus and Hamlet, Jonson’s Catiline, and Massinger’s The Roman Actor (with its strong relation to Jonson’s Sejanus). Vernon Guy Dickson is Associate Professor of English at Florida International University, USA.